Michele Tafoya who is an American Sportscaster is well known as an NBC Sunday Night Football reporter. Tafoya is the first female analyst to call UNC-Charlotte men’s basketball games and not only that she is also the first woman to call television play-by-play of an NCAA tournament game which makes her the most prominent sports broadcaster in the entertainment arena. Since 2011, she has been a reporter for NBC Sports, NBA and NBC. She is married to Mark Vandersall since 2000. She shares two children; a son and a daughter with him. 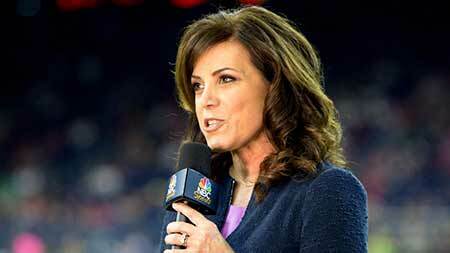 Michele Tafoya was born on 17 December 1964, in Manhattan Beach, California, US. She is an American by nationality belonging to the White-American ethnicity. In 1988, Tafoya earned a B.A degree in mass communications from the University of California-based in Berkeley. Then she attended the University of Southern California and got masters in business administration in 1991. Tafoya began her journalism career by first working as a host and reporter for KFAN-AM in Minneapolis. Preliminarily she worked for Minnesota Vikings and University women’s basketball broadcasts. She then began working in Charlotte for WAQS-AM. While in Charlotte, Tafoya used the name Mickey Conley to address herself. Then she became the first woman analyst to call UNC-Charlotte men’s basketball games. Tafoya then began serving as a Minnesota Timberwolves host and sideline reporter as well as a play-by-play commentator for Women’s Big Ten basketball and volleyball for the Midwest Sports Channel. Tafoya worked hard and spent three years in Minneapolis working for WCCO-TV as a sports anchor and reporter. In September 1994, she began working as a reporter and host for the CBS Television Network's CBS Sports Spectacular which is anthology show and also college basketball coverage. Tafoya also worked as a host of At The Half and as an exclusive reporter for college football games. 1994 U.S. Open Tennis Championship was where Tafoya made her on-air debut. Two years later Tafoya went on to create magic at CBS Network when she became the first woman to call television play-by-play of an NCAA tournament game. Tafoya was also the late night co-host of the 1998 Nagano Olympics in Nagano. She has hosted various shows including CBS NCAA Tournament Selection coverage show, Goodwill Games, and the US Open Tennis Championship coverage. After five years of work with CBS, she left the network at the end of 1999. Tafoya joined ESPN and ABC Sports network straight after where she worked as a sideline reporter for ESPN Monday Night Football commencing in 2006 NFL Season. From 2004 to 2005 she was the sideline reporter for ABC Sports’ Monday Night Football. Meanwhile, she was a co-host on ESPN Radio for the Mike Tirico Show. Since then she has done many works including helping ABC in the coverage of the Super Bowl XL in Detroit as a sideline reporter. Michele Tafoya has worked as a sideline reporter for many years since 2006. Tafoya was loaned to NBC Sports as a reporter for Rhythmic Gymnastics and the play-by-play woman for softball for the 2000 Sydney Olympics. It was announced on 21st October 2008 that she would be resigning from her duties as head NBA sideline reporter to spend more time with her family. She was the men’s and women’s NCAA basketball play-by-play and studio host and also a sideline reporter for college football and basketball. Tafoya has also been a panelist on The Sports Reporters II and a substitute host on Pardon the Interruption. While in ESPN she hosted skiing telecast and the network’s college basketball selection shows. Tafoya has worked as a correspondent for both SportsCenter and Outside the Lines. She left ESPN for NBC Sports at the end of 2010-2011 NFL seasons. On 20th April 2009, Tafoya was announced to become the new evening drive time talk radio host for WCCO-AM. Her show that began on 1st June 2009 ended on 27th January 2012. In the meantime, Tafoya also worked as a new sideline reporter for NBC Sunday Night Football. Tafoya has not faced many controversies in her career but one of them prominently peeks out, and that is when she purposely poured beer over two fans beneath her luxury box at the Metrodome during a 25th October 2003 the University of Minnesota versus University of Michigan game. Later, she told the media that she was humiliated due to the incident and was sorry for whatever she did. Michele has bagged two Emmy Awards; first during her initial year at NBC, when she won the award for outstanding sports personality in 2011 and second when she won the same award in 2013. Not only the Emmy’s but Mrs. Vandersall has also been able to win two Gracie Awards; the first in 1997 for her WNBA work with Lifetime and second in 2014 for her work on Sunday Night Football. Tafoya was ranked among the most likable TV sports personalities including Biggest Trend-Setter in 2006 by the Davie –Brown Index and was ranked fourth on the list of the top female sportscasters in 2009 by the American Sportscasters Association. Tafoya was honored by Gracie Awards for “Outstanding Achievement by an Individual On-Air TV personality” in 1997 for her excellent play-by-play calling of WNBA games on the Lifetime Television. While still with the network she worked as a reporter for the coverage of NFL college football together with the 1998 National Championship Orange Bowl. 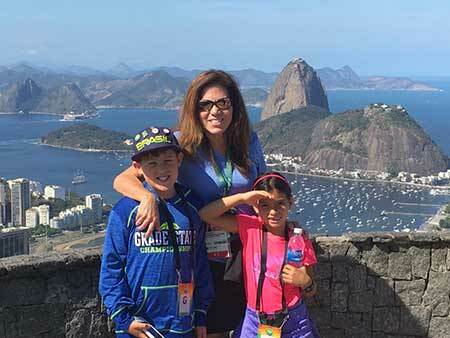 Michele Tafoya admits that she has been juggling family and career and has at many times left her networks to spend time with her family. Her annual salary is $200k and has maintained a wonderful net worth of $2 million. The anchor and reporter Michele Tafoya has involved in charity works for several years now. She has raised fund from numerous fundraising websites like Go Fund Me and Kickstarter and RocketHub. Tafoya, age 52, is married and has two children. She married Mark Vandersall who is a Minneapolis-based financial advisor in 2000. Michele and her husband Mark are parents to two children. They had their first child in November 2005. Tafoya stated that she was surprised when she was pregnant at the age of 40 after four miscarriages. She also revealed that she was suffering from anorexia when she was a kid and that she was down to about 80 pounds. The couple adopted a baby girl two years later after their first kid. The family seems to be happy. Her husband Mark Vandersall is a private wealth advisor based in New York City. He has worked as a private wealth advisor with Ameriprise Financial Services in Edina since his graduation. He also runs his own of office, Vandersall & Associates. His foundation for my approach to financial planning is based on a personal relationship with his clients. They develop a client’s personal strategy. Tafoya and Vandersall have been a great support of each other for a long time. The couple has figured out how to make their career, which includes a lot of travel, works and parenting two children. 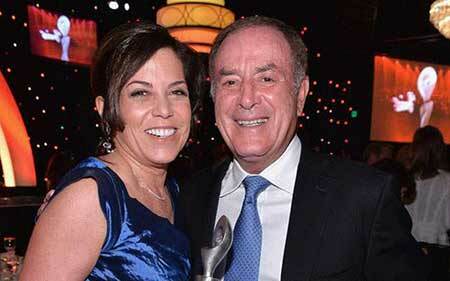 There are no such rumors about Tafoya having an affair with anyone. Except, the one time the internet exploded when Ravens WR Jacoby Jones flirted with Tafoya during an interview. There have been no signs of divorce on the way as Mark and Michele seem happy together.